The problems involved in designing optimal infrared (IR) measuring systems under given conditions are commensurately complex. The optical set-up and radiation conditions, the interaction between sensor and irradiation and the sensor itself, determine the operation of the sensor system. Simple calculations for solving these problems without any understanding of the causal relationships are not possible. Thermal Infrared Sensors offers a concise explanation of the basic physical and photometric fundamentals needed for the consideration of these interactions. It depicts the basics of thermal IR sensor systems and explains the manifold causal relationships between the most important effects and influences, describing the relationships between sensor parameters such as thermal and special resolution, and application conditions. 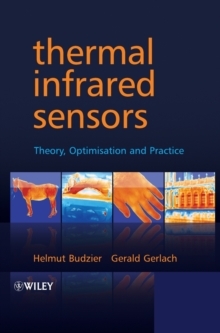 This book covers: * various types of thermal sensors, like thermoelectric sensor, pyroelectric sensors, microbolometers, micro-Golay cells and bimorphous sensors; * basic applications for thermal sensors; * noise - a limiting factor for thermal resolution and detectivity - including an outline of the mathematics and noise sources in thermal infrared sensors; * the properties of IR sensor systems in conjunction with the measurement environment and application conditions; *60 examples showing calculations of real problems with real numbers, as they occur in many practical applications. This is an essential reference for practicing design and optical engineers and users of infrared sensors and infrared cameras. With this book they will be able to transform the demonstrated solutions to their own problems, find ways to match their commercial IR sensors and cameras to their measurement conditions, and to tailor and optimise sensors and set-ups to particular IR measurement problems. The basic knowledge outlined in this book will give advanced undergraduate and graduate students a thorough grounding in this technology.